Dakota Odor Bomb Car Odour Eliminator - Destroy car odours quickly and permanently with the Dakota Odour Bomb. The Dakota Odor Bomb is a permanent, one-time odour eliminating fogger. If a bad smell is lingering in your vehicle, clear the air with an Odour Bomb. 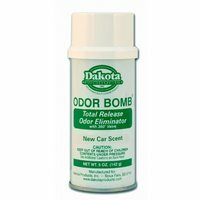 The Dakota Odor Bomb is more than an air freshener - it´s a car odour eliminator! Odours are eliminated permanently. This is not a cover-up deodorizer. Odor Bomb destroys odours caused by urine, decay, tobacco smoke, cooking and mildew, etc. The worst smells will disappear!